Palm's Bach is a 2 bedroom Waitarere Beach bach plus a 1 bedroom original bach sleepout. This classic kiwi set up offers a traditional bach stay less than a 5 minute stroll to the beach! 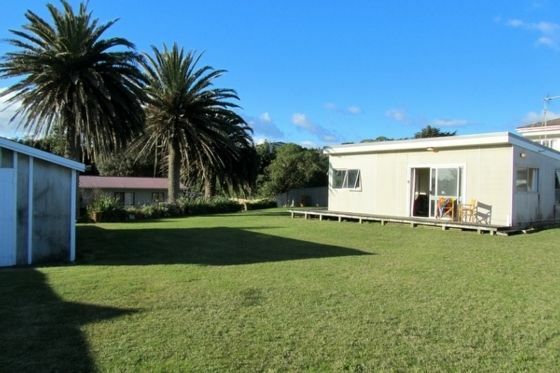 This Waitarere Beach bach is set on a flat, fully fenced section - ideal for family games!. The 2 bedroom bach includes simple, open plan living that flows onto the deck... Sit back in the sun with your morning cuppa! Each of the bedrooms is located off the living area. Bedroom 1 is fitted with a double bed, and bedroom 2 is fitted with 2 singles. The combined laundry, bathroom, and toilet complete the bach layout. The sleepout is a simple and compact original bach, with open plan living that leads onto the lawn. There is 1 bedroom just off the kitchen area with 2 sets of single bunks. There is also a double sofa bed in the lounge when required. The combined bathroom and toilet complete the sleepout layout. When you are not relaxing in the sun with your group, meander to the beach just minutes from your door! Palm's Bach is a convenient option for a family group to share a beach holiday together... Waitarere Beach welcomes you! Please note that there is a maximum of 8 adults at all times. Minimum nights, bond, special conditions and other fees may apply. One block walk to dairy, or one block walk to restaurant and beach. Lovely classic kiwi bach in a superb location, very close to the beach, cafes and playground. Great clean bach plenty of room , fab location . Classic Kiwi bach, great location, kids enjoyed the large section, excellent selection of books and DVDs, and very good comms from the owner. Thank you, would definitely return. A lovely weekend. All we needed. Basic needs fully met. Good location for my older parents. Close to café, shop and eateries. Rustic but cool! Great for two families. We really enjoyed staying here. Loved the old style Bach. Great location.